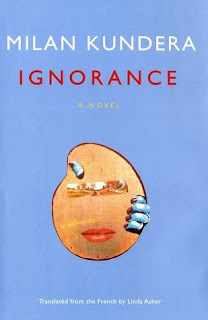 Retro Review - Milan Kundera's "Ignorance"
Home » books » literary fiction » milan kundera » retro review » translation » Retro Review - Milan Kundera's "Ignorance"
It is really rare for me to re-read a book. I am constantly aware of the pressure of passing time, and the number of truly insightful and wonderful authors in the world that I haven't even discovered yet. In fact, I could count the books I've re-read on one hand, that's how rare it is. Czech author Milan Kundera writes books I want to re-read. After reading The Unbearable Lightness of Being, I went on to beg, borrow and buy all of his other novels. He's really that good (seriously, read him now). Ignorance tells the story of Irene, a Czech immigrant living in France. When communism falls in Czechoslovakia in 1989, she has been in exile from her home country for many years, yet she must make 'The Great Return'. While on her way back she encounters Josef, a man she almost began a romance with when she lived in Prague. He too, is making the return to his homeland. As their paths cross, they must reaquaint themselves with their homeland, and their memories. Now I've made an attempt at giving you a flavour of the plot, I should mention that you can't summarise a Kundera novel. Have you ever read an author and felt as though they're whispering directly to you? That they're actually looking into your mind? This is what Kundera does to me, and I especially love this book. Ignorance is a story about nostalgia, identity, memory, and loss. In fact, it was after a particularly poignant moment of nostalgia yestereve, that I decided I had to read this book again (I think Kundera would approve of this impetus). She is experiencing a brand new feeling called nostalgia. That feeling, that irrepressible yearning to return, suddenly reveals to her the existence of the past, the power of the past, of her past; in the house of her life there are windows now, windows opening to the rear, onto what she had experienced; from now on her existence will be inconceivable without those windows. Kundera writes that nostalgia is most prominent in the young, and I agree with this. The young have time to dwell on the past, the old have no time to waste. He is not afraid to be the authorial voice. The reader is aware of his presence; we are aware that he is the one philosophising on memory and nostalgia, yet he writes in such a way that the transitions between his character's feelings and emotions, and his own, are seamless and natural. For after all, what can memory actually do, the poor thing? It is only capable of retaining a paltry little scrap of the past, and no one knows why just this scrap and not some other one, since in each of us the choice occurs mysteriously, outside our will or our interests. We won't understand a thing about human life if we persist in avoiding the most obvious fact: that a reality no longer is what it was when it was; it cannot be reconstructed. His writing is like a thought process, albeit an extremely articulate, and beautifully phrased thought process. And his characters are all so wonderfully flawed. They make mistakes, they feel uncomfortable, and they are plagued by self-doubt. This is not to suggest a host of neurotic characters, but rather that they feel more real to me because I can relate to them. They are complex, just as we are. Let me finish by saying that Kundera is a writer who makes me feel less alone.